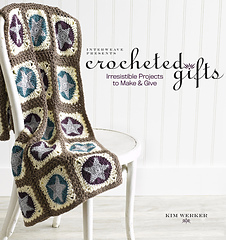 Crocheted Gifts is a compilation of patterns from many of our favorite crochet designers, with text by Kim Werker. The patterns include afghans, hats, purses, socks, washcloths, scarves, and more. Styles vary ensuring that you can find something for everyone, with two of the most interesting items being the Wire Hairpin-Lace Bowl by Donna Hulka and the Shawlette in Chains by Kristin Omdahl. The book includes plenty of photographs, detailed instructions, and schematics or symbol charts as needed. The hardest part of making these items is actually giving them away … especially, my favorites, the All-Star Blanket by Doris Chan, the Swirling Bag by Kathryn Merrick, and the Sisal Spiral Rug by Julie Holtz.